DETAILS: An exquisite new construction home in Miramar Beach! 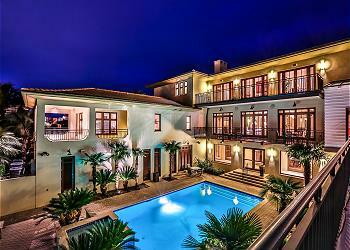 This gorgeous estate features 6 bedrooms, 7.5 bathrooms, and incredible accommodations for 32 guests. A private pool, expansive outdoor porches, two outdoor kitchens, and an elevator to access all three floors make this home a perfect fit for your multi-generational or multi-family vacation! On the first floor are two beautiful guestrooms. The first offers a king bed, a built-in queen-over-queen bunk bed, and a private en suite bathroom with a shower. In the second room are two built-in queen-over-queen bunk beds and a private bathroom with a shower. Also on this level is a spacious entertainment room and access to the outdoor oasis. The second floor serves as the main living floor for the home. This large and open-concept floorplan allows guests to enjoy the spacious amenities and welcoming ambiance. Guests will enjoy the grand fireplace, abundant natural light, and plush furnishings in the living room. Transom French doors provide access to the porch, where guests can enjoy grilling a meal with a stunning emerald coast view. Enthusiastic cooks and foodies will love the gourmet kitchen, which offers exquisite finishes and top-of-the-line stainless steel appliances—including double ovens and microwaves. The home’s stunning master suite is also on this level and offers a luxurious king bed and a private en suite bathroom with a shower. The third floor presents three stunning guestrooms with a variety of sleeping options. The first bedroom features a king bed, two built-in full-over-full bunk beds, and a private bathroom with a shower and separate soaking tub. The second room offers a king bed and a private en suite bathroom with a shower. In the third bedroom, guests will find a king bed, a built-in twin-over-twin bunk bed, and a private bathroom with a shower and separate soaking tub. In the outdoor oasis, guests will love the sparkling pool and hot tub, complete with a generous pool deck for relaxing. Guests in this home can also enjoy the sugar white sand and emerald waters of Miramar Beach just a few steps away via private access. This home is equipped with 6 custom 360 Blue adult beachcruiser bikes, which are a breezy and relaxing way to experience all the charm of our 30A coastal towns. This one-of-a-kind, new construction Miramar Beach home is perfectly equipped with everything you need for your next large-group getaway. Contact 360 Blue today to book your stay at 45 Beach Drive East!